At the time of his inauguration, George Washington was described in almost universally glorified terms by the national presses. However, by the end of the President's first term, hostile newspaper writers were attacking the administration's domestic and foreign policy. These attacks escalated in Washington's second term into personal attacks questioning his integrity, republican principles, and even military reputation. While the harsh attacks may have initially backfired on Washington's political opponents, the President's bad press signified the opening of a new type of political force, and one that had significant effects on the course of the Washington presidency. The number of newspapers printed in the United States exploded in the period of the Early Republic, and the presses became much more fiercely partisan than during both the Colonial and Revolutionary periods. The popular press exploded from under fifty newspapers around 1776 to over 250 by 1800, encouraged by new federal laws that made it cheaper to send newspapers through the postal system.1 Newly aggressive newspaper editors toke a stronger role in shaping the newspaper's message in support of, or in opposition to, the government. The first significant press criticisms concerned the Washington administration's supposed "monarchial" style, including its formal European-style levees and other "aristocratic" behavior, as well as Secretary of Treasury Alexander Hamilton's economic program.2 Interestingly, these initial attacks betrayed a certain "monarchial" style of thinking themselves. Washington’s earliest critics seemed reluctant to criticize the revered President himself. They thus blamed the "errors" of his government on evil sycophantic ministers. As Thomas Jefferson wrote privately to James Madison, his close confidant, "the President, tho' an honest man himself, may be circumvented by snares and artifices, and is in fact surrounded by men who wish to clothe the Executive with more than constitutional power. "3 The President's "monocratic" ways proved to be a contentious issue throughout his administration, one which only garnered more criticism as an opposition to his policies mounted. By the end of 1792, there was a recognizable opposition party, centered around disgruntled Secretary of State Thomas Jefferson; newspapers gave this party one of their strongest means of critiquing the Washington administration. Although he denied it publicly at the time, Jefferson was a key figure behind the scenes in establishing the opposition presses. While press criticism in these early years was more restrained than later salvos and rarely attacked Washington personally, by the end of 1792, the opposition newspapers had succeeded in framing the debate over Hamilton's economic plans and the general direction of the administration in term of "republicanism" versus "aristocracy." Attacks frequently depicted the Washington administration as a force for the latter. While Hamilton's economic programs (particularly the Whiskey Excise and the federal assumption of public debt) provoked significant criticism, the most harsh press criticism was triggered by unfolding events in Revolutionary France. Washington's proclamation in April of 1793 that the United States would remain neutral in the growing contest between Revolutionary France and Great Britain provoked a firestorm of protest. Washington's fiercest critics were united by a strongly pro-French orientation with regard to foreign policy rather than domestic political views. The two most powerful opposition editors, Phillip Freneau at the National Gazette and Benjamin Franklin Bache at the Aurora, both viewed the French Revolution as a continuation of the ideals of the American Revolution. The peak of press attacks against Washington came with the public announcement of the controversial Jay Treaty with Great Britain in 1794, which attempted to ward off an impending war with Britain at the expense of American-French relations. Even before the terms of the treaty were announced, Jay's negotiations stirred up widespread opposition. The hostility was triggered not only by anti-British sentiment, but also by fears that the President was overstepping his authority in negotiating the treaty. The negative press attacks may well have been a major reason for Washington's decision to retire in 1796. Adding insult to injury, one of the most violent attacks on Washington’s reputation came just as the President was preparing to leave office.10 Thomas Paine, who had in earlier writings praised Washington's selfless service, now turned on his former friend. Paine was furious that Washington had done nothing to get him out of French prison during the Terror, and accused Washington of using his presidency to enrich himself and his allies at the expense of his former veterans and the country at large. Paine proclaimed: "Monopolies of every kind marked your administration almost in the moment of its commencement. The lands obtained by the revolution were lavished upon partisans; the interests of the disbanded soldier was sold to the speculator; injustice was acted under the pretence of faith; and the chief of the army became the patron of the fraud." While the newly partisan presses gave Republican editors a greater voice in politics, in many ways the harsh attacks backfired with regard to public opinion. By 1796, with popular opinion increasingly turning against both Revolutionary France and the most extreme critics like Bache and Paine, Republican editors began moderating their tone. William Duane, B. F. Bache's successor at the Aurora, began his American publishing career with an attack on Washington, mocking the Farewell Address for both its egotism and partisan bias. However, the Aurora's memorial upon the President’s death took a much different tone, bidding Washington a respectful farewell. In the long run, the extremist tone of some of the 1790s presses may have actually strengthened the Federalist Party for a time, as well as provided public support for the attacks on press autonomy that occurred under the Adams administration with the Alien and Sedition Acts. 1. Jeffrey L. Pasley, The Tyranny of Printers: Newspaper Politics in the Early American Republic (Charlottesville: University Press of Virginia, 2001), Appendix I, 43. 2. See for example Philip Freneau's warning that Hamilton's public debt was a "Grand nostrum" for "changing a limited Republican Government into an unlimited hereditary one', National Gazette, 4 July 1792. 3. "Thomas Jefferson to James Madison, 26 November 1795," in Papers of Thomas Jefferson, ed. Julian P. Boyd, et al. (Princeton: Princeton UP, 1950-), 28: 540. 4. "Belisarius," "To the President of the United States," Aurora General Advertiser, 11 September 1795. Belisarius called the Jay Treaty "an instrument so deeply subversive of republicanism, and destructive to every principle of free representative government." The Jay Treaty was received by Washington in March 1795. He submitted to the Senate when they met in June, but enjoined the Senators to keep the terms secret. The full text of the treaty was leaked by the newspapers later that month, and then officially released July 1, 1795—just in time to turn Fourth of July festivities nationwide into anti-Jay protests across America. It was ratified in August of 1795. 5. "Leonidas," "French Influence," Gazette of the United States, 12 May 1797. 7. "Peter Hothead, Esq.," Gazette of the United States, 22 January 1796." For more guillotine references, see also "Simon Sparky, Esq." in Columbian Herald, 30 May 1796, and "Creed of a Modern Democrat and Creed of a Republican; or Federalist," American Minerva, 27 March 1794. 8. "Extract of a letter from a citizen of Carlisle, Pennsylvania," Aurora General Advertiser, 8 September 1795. 9. "Jefferson to Madison, 28 December 1794," in Papers of Jefferson, 28: 228-9. 10. An earlier draft of his Farewell Address showed how wounded the President was by the attacks on his integrity and motivations: "As this Address, Fellow citizens will be the last I shall ever make you, and as some of the Gazettes of the United States have teemed with all the Invective that disappointment, ignorance of facts, and malicious falsehoods could invent, to misrepresent my politics and affections; to wound my reputation and feelings; and to weaken, if not entirely destroy the confidence you had been pleased to repose in me; it might be expected at the parting scene of my public life that I should take some notice of such virulent abuse. But, as heretofore, I shall pass them over in utter silence..." For more on the earlier draft of the Farewell Address, see Washington on Washington, ed. Paul M. Zall (Lexington: University Press of Kentucky, 2003), 129. 11. Thomas Paine, "Letter to George Washington, 30 July 1796." The letter was published as a separate pamphlet by Bache. Text in Writings of Thomas Paine, ed. Moncure Daniel Conway (London, 1895; reprint London: Routledge/ Thoemmes Press, 1996), Vol. 3, 213-52. 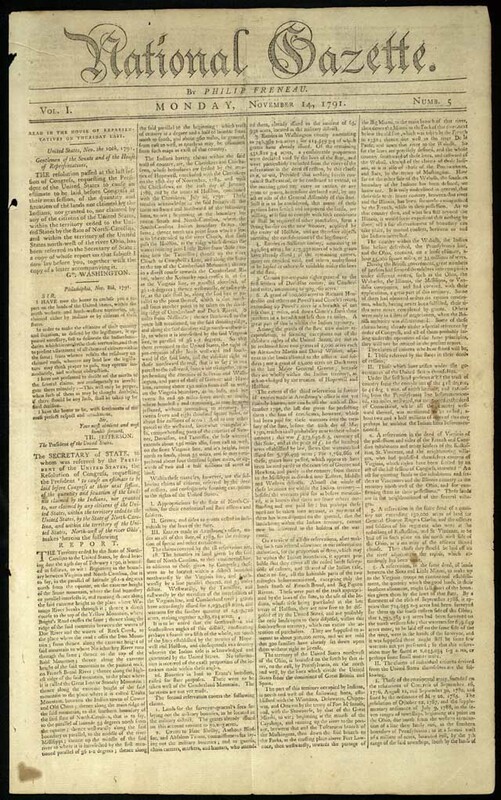 Andonian, Raffi E. "The Adamant Patriot: Benjamin Franklin Bache as Leader of the Opposition Press," on Unearthing the Past: Penn State University Libraries Digital Collections. Freneau, Philip. National Gazette, 14 November 1791, Library of Congress: Thomas Jefferson, Establishing a Federal Republic.